The New York Times - A court in central Vietnam convicted 14 bloggers, writers and political and social activists on Wednesday of plotting to overthrow the government and sentenced them to prison terms ranging from 3 to 13 years in what human rights groups said was the largest subversion case to be brought in years. The defendants were arrested in 2011 and accused of links to a banned pro-democracy group led from California. The government says the group — Viet Tan, or Vietnam Reform Party — seeks its overthrow. A number of the defendants are members of the Redemptorist group in the Roman Catholic Church, which has been engaged in community service and has taken up the causes of land seizures and corruption. Redemptorist activists have become increasingly assertive in Vietnamese movements for democracy and human rights, and some churches and parishes have become centers of dissent. Nguyen Thi Hue, a defense lawyer, told The Associated Press in Vietnam that three defendants in the two-day trial in the city of Vinh, in Nghe An Province, had been sentenced to 13 years and that 11 others had received terms of three to eight years. One of the three-year terms was suspended. The charges of “activities aimed at overthrowing the people’s administration,” of “undermining of national unity” and of participating in “propaganda against the Socialist Republic of Vietnam” have often been brought against dissidents in a government crackdown that has waxed and waned over the years. Phil Robertson, deputy director of the Asia division of Human Rights Watch, said this was the largest group to be brought to trial together in recent times. Mr. Robertson said the defendants had been charged after attending a training course in Bangkok held by Viet Tan. In the 1980s, the group led a resistance movement against the Vietnamese Communist government, but for the past few decades it has declared that it is committed to peaceful political reform, democracy and human rights in Vietnam. Some defendants had also participated in peaceful protests in support of other dissidents who were on trial or in relation to China. Protests have grown in recent years over China’s claims to disputed territory in the South China Sea and over a major bauxite plant run by China in Vietnam’s central highlands. The government has cracked down on demonstrations and Internet commentary for fear they could veer out of control and because of an antigovernment tone in many of them. The other 13 convicted, as listed by Human Rights Watch, are Dang Ngoc Minh, Ho Duc Hoa, Ho Van Oanh, Le Van Son, Nguyen Dang Minh Man, Nguyen Dang Vinh Phuc, Nguyen Dinh Cuong, Nguyen Van Duyet, Nguyen Van Oai, Nguyen Xuan Oanh, Nong Hung Anh, Thai Van Dung, and Tran Minh Nhat. As the Vietnamese economy grows fitfully and its expanding middle class becomes more lively and engaged, the government has carried out vigorous campaigns to police the Internet and curb public demonstrations. In a New Year’s address that assessed the gains and shortcomings of Vietnam’s leadership, Prime Minister Nguyen Tan Dung restated the government’s concern that conspirators continued to threaten to undermine it. “We are regularly challenged by conspiracies to spark sociopolitical instability and violate our national sovereignty and territorial integrity,” he said. The newspaper said the woman, Lo Thanh Thao, 36, had “scattered propaganda leaflets” and “stuck them inside several buildings” in Ho Chi Minh City. It did not report the content of the leaflets. In the most high-profile recent conviction, a prominent Vietnamese legal scholar who had sued the prime minister and called for multiparty democracy was convicted in April 2011 of propaganda against the state and sentenced to seven years in prison and three more years under house arrest. The conviction of the scholar, Cu Huy Ha Vu, then 53, the son of a Communist revolutionary and a well-known poet, was one of dozens involving Vietnamese lawyers and activists over recent years. Last March, two Catholic activists were sentenced to five and three years in prison for distributing what the indictment called antigovernment leaflets. In September, three prominent bloggers received long prison terms. Among them was Nguyen Van Hai, who wrote under the name Dieu Cay, who was sent to prison for 12 years. Source: The New York Times, January 9th, 2013. 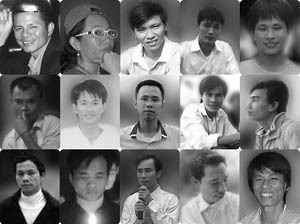 Amnesty International, Viet Nam: Release 13 activists jailed on baseless charges, stop crackdown on dissidents, 9 January 2013.